Few companies have reached the level of iconicity that surrounds the Martha Graham Dance Company. Of course, much of this is due to the sheer iconicity of Martha herself – her talent for embracing the overtly dramatic without lapsing into the ridiculous led her to create works that are profound not only for the inventiveness of their movement, but also for the extraordinary honesty of characters she presented on the stage. This week, in a very limited engagement at New York City Center, MGDC proved that the spirit of Martha is alive and well in the company today, quite obviously a driving force behind this season’s programming. This season featured two programs, each connected to the general theme of “Myth and Transformation,” a fitting description of the concepts present in many of Graham’s works. A quote from Graham noted in the program provides insight into Graham’s (and the current Artistic Director, Janet Eilber’s) thinking about the works shown this season: “We don’t know about the past, except as we discover it. And we discover it from the now.” Fittingly, for Thursday’s performance on the first day of spring, the company presented two of Graham’s most beloved works, Appalachian Spring (1944) and The Rite of Spring (1984); sandwiched in between was the world premiere of Nacho Duato’s Depak Ine, a new work made for the Graham Company in just five weeks prior to the performance. It’s no secret that programming is key to selling out big theaters like the Koch Theater or City Center, and the Graham Company took full advantage of its stellar repertoire to put out the best of the best for this season’s presentation. The show opened with Appalachian Spring, a Graham masterpiece set to Aaron Copland’s score of the same name, which was commissioned specifically for this work. A piece for eight dancers, the work portrays a frontier couple on their wedding day (Graham herself originated the role of “The Bride”), led forward by the steadfast Pioneer Woman (played by the utterly inimitable Katherine Crockett). In her plans for the piece, Graham informed Copland that she envisioned the piece as “a legend of American living, like a bone structure, the inner frame that holds together a people.” As the piece unfolds, the characters are clearly connected by their energetic references to their future life. The Preacher (played with exuberance by Lloyd Knight) dances a solo full of incredible jumps while his Followers, a quartet of blue-clad women, perform phrases reminiscent of jovial communal square dances. A beautiful duet by The Bride and The Husbandman (Blakeley White-McGuire and Abdiel Jacobsen, respectively) and a fantastic solo by Crockett reinforce the importance of precision in form and dynamic that define Graham’s work. Not a finger is out of place; not a wobble detected in any precarious balance. Framed (quite literally) by Isamu Noguchi’s set that suggests a newly raised homestead, complete with fence and pasture, the brilliant dancing prevented the piece from feeling dated. The second Graham work, The Rite of Spring, was equally as iconic, and perhaps even more so given the intense historical relationship that Igor Stravinsky’s 1913 score has with dance. References to Nijinsky’s choreographic interest in two-dimensionality (something that was also picked up by Paul Taylor for his version, Le Sacre du Printemps (The Rehearsal)) percolate through Graham’s choreography, as does an adherence to the typical narrative – out of a group of women, a Chosen One (danced this performance by Xiaochuan Xie) is selected as a sacrifice and made to ceremoniously dance herself to death. Created towards the end of Graham’s career, The Rite of Spring contains some of the best examples of her now-codified dance vocabulary. The tightest contractions are juxtaposed with extreme length and expansion; the angles of the knee and elbow joints are perfectly uniform throughout the ensemble. 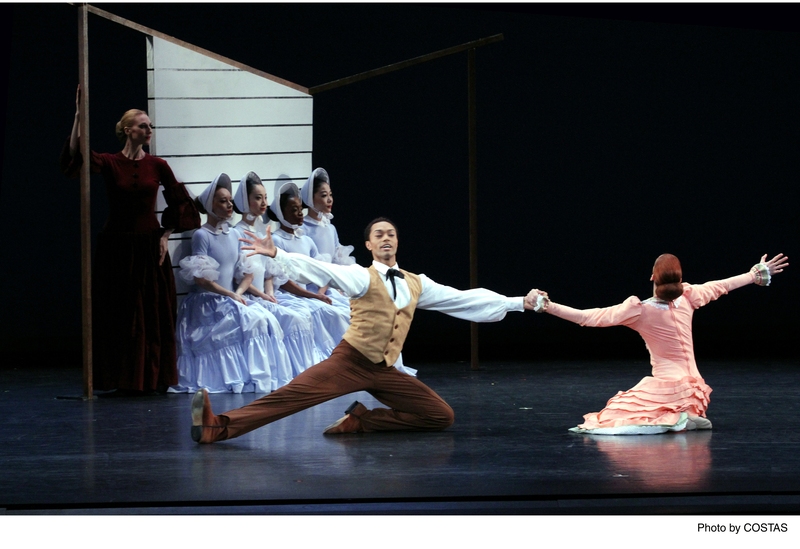 As in Appalachian Spring, the intense training of these dancers in Graham’s technique is obvious, and lends itself well to the concept of The Rite of Spring. The practiced (and perfected) look of the ensemble phrases enhances the characterization of a community that has convened to perform a familiar, impulsive ritual: it’s almost as if the dance is happening to them, rather than being consciously performed by individuals. For one entrance, six men enter the stage by hopping backwards in a line, throwing their bodies into their air for a huge jump in the center splits every third bounce. Each time, the split is not only perfectly timed, but the height of their jump is perfectly aligned. Xie and Ben Schultz (as The Shaman) shine in their leading roles. The slender Xie, with hair down to her waist, looks the part of the innocent victim, but her dancing proves she has a reserve of strength (as well as agency) to get her through the daunting solos. Coupled with Stravinsky’s emotionally provocative music, the dancers brought out the anxiety, fear, and, eventually, relief that makes the Graham’s tableaus so startling. Although both Graham works were fantastically presented, the most sensational work was the program’s centerpiece, Duato’s Depak Ine. Before the show, Eilber gave the audience a few notes about the new work, including the hint that Duato has been reading some Darwin while thinking about this piece. Although that wasn’t a green light to read natural selection into the piece, it’s also hard to deny the theme of survival of the fittest in Depak Ine. Compared to Graham’s carefully practiced postures, Duato’s choreography shows off the extreme versatility of these dancers. They throw themselves across the floor, leap into each others’ arms, they partner each other in trios and quartets. Their spines are serpentine, and each limb seems to have a mind of its own. It’s fascinating to watch, knowing that these are humans performing this distinctly non-human movement. Indeed, with a soundtrack reminiscent of a tropical jungle, it’s almost easy to forget that we’re watching this in a theatre. Depak Ine is a work in three parts, and as the light rises on the first, the audience is greeted with the motionless body of PeiJu Chien-Pott sprawled face down in the downstage right corner. As the other dancers enter, some crawling, some jumping and rolling, they each approach her, as if to see if her seemingly lifeless body is up for grabs. The cast takes turns pulling each other away from Chien-Pott, but it’s uncertain if some of them are genuinely trying to protect her, or if they just want her for themselves. It’s just about when we’ve given up hope for this body that is springs to life, shakily at first, for the second section of the piece. Once whe is joined by Tadej Brdnik, Lloyd Mayor, and Ben Schultz, the quartet undertakes an incredible series of partnering sequences in which Chien-Pott is simultaneously leading this rendezvous, while remaining at the mercy of wherever her sycophants decide to place her, be that above their heads or at their feet in magnificent contortions. By the end of the act, however, Chien-Pott is back on the floor, motionless, and just in time, for the third section begins with a reprise of the first. Again, the dancers approach her, wondering how this mysterious creature is still here. For lack of a better comparison, Chien-Pott is the opossum of the piece, and in deceiving her fellow inhabitants, she remains untouched. Duato calls up nothing short of a new virtuosity from the Graham ensemble, made all the more impressive by the fact that this all came together in just over a month. As the great companies of the twentieth century age, the question of bringing in new choreographers to mingle with the legacies of modern dance figureheads has been met with various responses. Some have ended with success (as in the case of Alvin Ailey American Dance Theater), but for many, the road is not yet clear. But this season, Martha Graham Dance Company has done well to commission two new premieres (the other is from Greek choreographer Andonis Foniadakis). By diversifying their repertoire while still showcasing the impeccability and relevance of their training as Graham dancers, the dancers prove themselves to be truly some of the greatest dance talents performing today, and even after eighty-eight years, a staple of the New York City dance community. Katherine, nicely reviewed. A useful and good blog. I thought you might be interested in this obituary–it is of the grandmother of a friend of mine. Bob Roistacher–we met at City Center last Thursday with my sister Betsy and friend Ardith.